YouTubers often promote their videos in ways similar to how traditional media companies promote their stories, blog posts, or films. Therefore, the best times to promote your videos on social media mirror the best times these media outlets have found to promote their own content. In an updated study, Coshedule broke down the best times for media companies to promote their content online. First, determine what the most populated time zone in your country is. If you’re in the United States, for example, then most of your potential American viewers live in the eastern and central time zones. Base your video promotion schedule around the biggest time zone where you live. Tweet your video links several times throughout the day. Twitter is the social media that’s the quickest for users to consume. That’s why people use it so often throughout the day. If you’re looking for more flexibility with your video promotion schedule, then Twitter is your best bet. The best times to promote your videos on Twitter are between 6-7 a.m., 11 a.m., 7-8 p.m., and 10 p.m. Choosing one person who RT’s to be next videos shoutout! Share your videos to Facebook around a typical 9-5 work schedule. Many Facebook users go online with their mobile devices during their work commutes and lunch breaks. So, you should promote your videos on your Facebook page when someone who works a standard 9-5 work shift has a break. Specifically, the best times to promote your videos on Facebook are 7 a.m., 11 a.m., and 6 p.m.
Post on Instagram around a typical school day. Because Instagram is more popular with the younger crowd than Facebook is, the best times to promote your videos are before and after class. If you’re trying to promote your videos in a certain country or region, then you should research what times schools in those areas get out for the day. Generally, the best times to promote your videos on Instagram are 9 a.m., 12 p.m., and 3 p.m.
To promote your videos on Instagram, you can either upload snippets to your story or tell your followers about a new video in the caption of a regular post. To make your video promotion more successful, stay consistent with the times you post. Come up with a few different ways to promote each new video on different platforms. 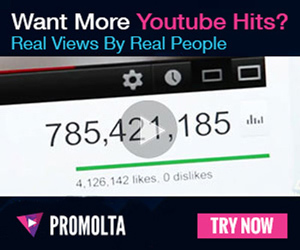 Keep promoting your new video online until the next one comes to ensure maximum views!